Released 3 revisions of the Librem 15 laptop. Released 2 revisions of the Librem 13 laptop. Persevered in our efforts and upheld our promise to port coreboot to all our devices. We have been the first manufacturer to disable the Intel Management Engine (and we are currently still the only vendor of brand new devices doing this with devices shipping out today…). Received FSF endorsement for PureOS. Exceeded our funding goal by almost 50% for our Librem 5 phone campaign. Release the development board for the Librem 5 phone. Produce great documentation for developers to write applications into PureOS (or any GNU/Linux based OS) for the Librem 5 phone. Attend significantly more conferences and events; this lets us meet long-standing collaborators, improves our own knowledge, and also lets us raise awareness about our ideals and approaches to solving long-standing challenges in the industry. Release our Purist Ethical Services offering (more news on this later). Advance the Librem 15 and Librem 13 laptops into a version 4 model. Release the much-awaited Librem tablet. Release TPM + Heads as a “turn-key” product on our devices. Things are off to a great start in 2018 and we hope you are as excited as we are to push forward the causes of freedom, security and privacy—principles that we hold as dearly as you do. 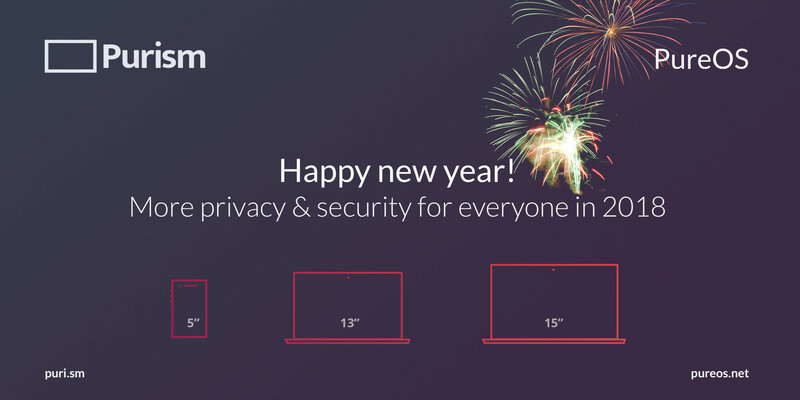 Happy New Year from your friends at Purism SPC!